The fact is that most women want to have it all: education, a career, a family. But fertility declines rapidly after 35. For some women, the decline starts much younger. Which makes your late 20s or early 30s the best time to check your ovarian reserves. It also makes this the best time to take action if your eggs' age doesn't match your actual age. AMH (Anti-Mullerian Hormone) is the best predictor of future fertility. AMH is produced directly by the ovaries and a low AMH has been proven to correlate with a woman's ability to produce oocytes (eggs). This is true even for women with regular periods. By age 35, the average woman's chances of conceiving every month are about half of what they were in her early twenties. By age 40, the average woman has a greater chance of having a miscarriage than having a successful pregnancy. And by age 45 nearly all women are infertile and unable to have their own biological child. Two little known causes of an early decline in egg quality and quantity are smoking and endometriosis. Either one can lead to early menopause, even in women with no symptoms. Most women with low ovarian reserve do produce enough hormones to get their periods. So having a regular period does not tell you what your egg reserve is like. 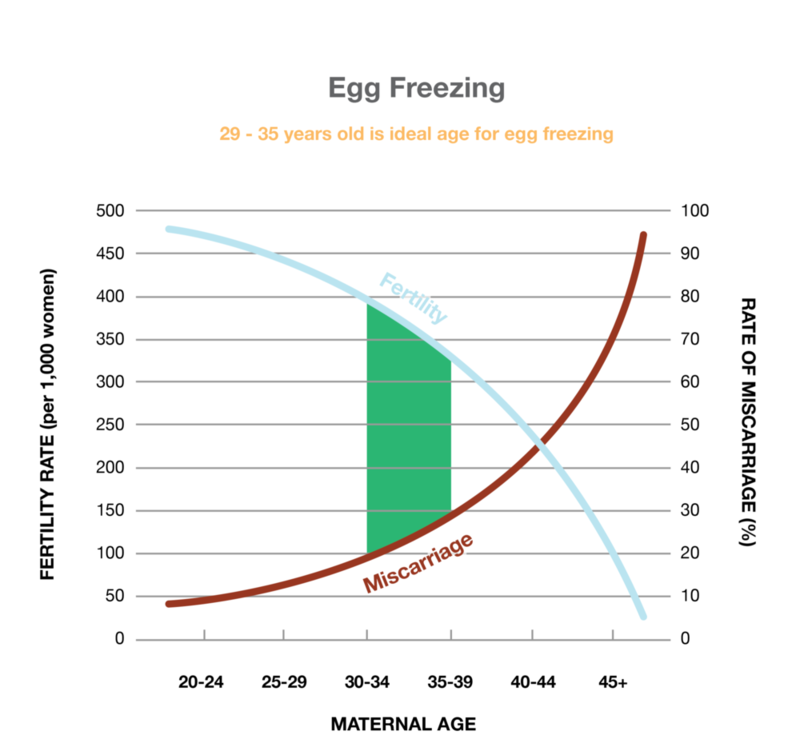 The ideal age to freeze eggs is before 35 where the rate of fertility dramatically decreases and the rate of miscarriage dramatically increases. For almost all women this is caused simply by the aging of her eggs. Science has proven that younger eggs have less genetic abnormalities.